Monday Minute - Boy, Have We Come A Long Way! I've been working on a book that tells the story of the Annapolis Yacht Club. It is well along in the process, and we are looking over old photos and materials to include in this book. I was given a box of history material to review and inside were three copies of Yachting magazine from 1936, 1949, and 1950. Wow, what a walk down Memory Lane...well, not my memory, mind you, I'm way too young! 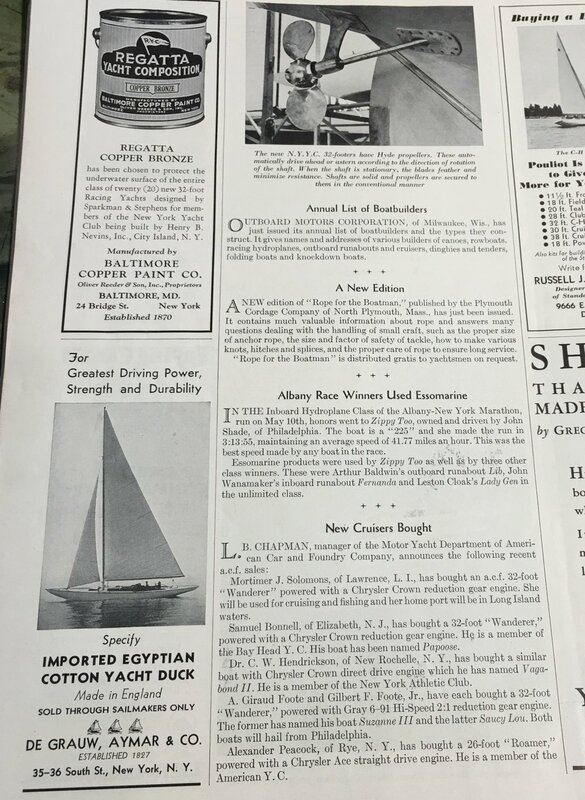 Looking at a boating magazine from the years before World War II is full of excitement and enthusiasm, as do those issues after the war, when the world was rebuilding and life improved for those who survived that ordeal. Each issue had a crinkly old piece of paper as a placeholder for some mention of Annapolis, AYC, or one of its members engaged in a race or cruise. In June, 1936 the issue cost 35 cents. I looked over the issues to see what boating was like back then. Here are some images from the 1936 and 1949 issues. I didn't know that we had feathering props back in 1936, such as this Hyde propeller. And who knew you should buy the finest Egyptian cotton for your sails? Or copper bronze bottom paint? Did you know you could buy a new marine engine for under $300? And check out this ad from Lucian Q Moffitt, part of the history of the cutless bearing. See my post https://www.followingseas.media/blog/2017/1/30/name-that-bearing-1. Despite what some professionals in the boating industry say, they are wrong. It is NOT a cutlass bearing! Note the cartoonist. Theodor Seuss Geisel is best known for authoring more than 60 children's books under the pen name Doctor Seuss (abbreviated Dr. Seuss), a name he adopted at Dartmouth College. In 1936 he worked as an illustrator for Standard Oil, hence this ad in Yachting. He would publish his first children's book, And to Think That I Saw It on Mulberry Street, the very next year in 1937. Life was simpler back then, in the years before the war. "What a swell lift that guy is getting up there." Motor yachts were slimmer than today's floating condos, and powered by much smaller engines. Efficiency is making a comeback these days, however. The back cover of the 1936 issue is a tribute to marketing. Did you know smoking Camel cigarettes is really good for you!?! In the years following World War II, boating got back to a new normal, with new technology and designs that came as a result of the war effort. The following pages are from the January 1949 issue. Hmmm, looks just like a Patrol Torpedo boat (PT Boat), but built in aluminum. Except it only uses two Packard PT-boat engines, instead of three. These beautiful engines were copies of the same Rolls Royce Merlin engines that powered the RAF, and the engines were used in our P-51 Mustang fighter. What a thrill it must have been to charge along on this beauty! Radio communications and "electronics" gathered momentum following the war, and as transistors and other inventions became more common, the world changed. Remember when radios used vacuum tubes? Did you ever build a crystal radio as a kid? The Reynolds boat was stamped out of a single piece of aluminum. Check it out at the Big Shows in New York and Chicago! Hope you enjoyed the walk down Memory Lane. Have a great week. Older PostWhat is Life Beyond Boating?